Automatic Water Samplers. As water monitoring requirements become broader and more demanding, Isco responds. Isco's advances include the first round sampler, first non-contacting liquid detector, first outdoor refrigerated sampler, and first sampler with interchangeable modules for measuring flow and parameters. Through listening to customers, continuous innovation and improvement, and emphasis on quality and reliability, Isco continues to lead the way with samplers for every application. 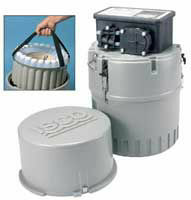 6712FR Refrigerated Fiberglass Sampler. The 6712FR is a sequential or composite refrigerated sampler designed for indoor or outdoor applications where rugged, corrosion-resistant construction is required. The heart of the 6712FR is Isco's advanced 6700 Series Controller. It allows you to select different programming modes to assure the most suitable routine for your application. Programming is fast and simple, with on-line help just a key stroke away. Isco 5800 Refrigerated Sampler. The 5800 Refrigerated Sampler is Isco's answer to the rigorous demands of water monitoring. With user-friendly controls and workplace-savvy features, the 5800 is the only choice for stationary sampling in both municipal and industrial wastewater applications. Along with easy control and on-site programmability, it also has a unique slide-out bottle rack that eliminates awkward stooping and bending when retrieving sample containers. The controller actively regulates and displays the sample compartment temperature, and logs a 24-hour summary to confirm proper sample cooling. Not only can you download the temperature record with a basic utility program such as Tera Term, you can also view this information on the unit display. 6712 Full-size Portable Sampler. ISCO's 6700 Series Portable Samplers have set the industry standard, providing the most comprehensive and durable performance available. With the introduction of the 6712, ISCO takes another step toward the ultimate by including SDI-12 interface capabilities. Programming is fast and simple, with on-line help just a key stroke away. The top-of-the-line 6712 sampler features an advanced controller that allows for the selection of different programming modes to ensure the most suitable routine for sampling. 6712C Compact Portable Sampler. The 6712C compact model gives you the world's most versatile sampler controller in a smaller-diameter package that fits in 18 inch and offset manholes. Large, comfortable handles make transporting safe and convenient even when wearing gloves. The NEMA 4X, 6 (IP67) enclosure is submersible, watertight, and dust-tight. Plug-in 700 Series Modules and the new SDI-12 interface make it easy to add flow and parameter monitoring to your 6712-based system. Programming is fast and simple, with on-line help just a key stroke away. 3700 Full-size Portable Sampler. The full-featured 3700 Sampler collects sequential or composite samples based on time, flow rate, or storm conditions. It's a great choice if you don't need the sophisticated parameter monitoring and logging capabilities of our 6700 Series. The exclusive LD90 gives you automatic compensation for changes in head height, plus automatic suction line rinsing to prevent cross contamination. There are no internal tubing connections, so cleaning and tubing replacement are fast and easy. The 3700 pump outperforms most competing samplers. 3700C Compact Portable Sampler. Smaller and lighter than the full size 3700 portable, the 3700C uses the same controller. 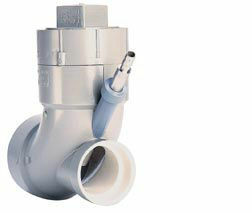 The 3700C will easily pass through an 18-inch diameter or offset manhole. Bottle choices with the 3700C are more limited than with the full-size model. The 3700C's bottle cartridge makes bottle changes fast and easy. The 3700 pump outperforms most competing samplers and maintains the EPA-recommended 2 ft/second line velocity at head heights up to 16 feet. 3710 Portable Composite Sampler. 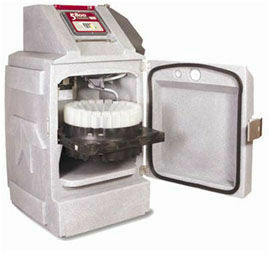 The 3710 Sampler combines simple operation and high volume capacity for single-bottle sampling. It collects composite samples based on time or flow intervals in a 2.5 gallon glass or polyethylene bottle, or a 4-gallon polyethylene bottle. Up to 24 sampling stop and resume times can be preset for unattended, automatic sampling. Setup and programming is a snap. Simply choose the options you need from the selections displayed on the two-line, backlit LCD. With a thermal resistance of R-11, you can be assured of maximum effectiveness for cooling samples. GLS Portable Compact Composite Sampler. The GLS Sampler is designed for general purpose or priority pollutant sampling in municipal and industrial applications where a full-size sampler is too large. It collects composite samples, based on time or flow intervals, in 1- or 2.5-gallon glass or polyethylene bottles, or in 2-gallon disposable ProPak bags. With the GLS's simplified programming, setup takes less than a minute. You can also key in an alternate program in the field, without losing your stored program. 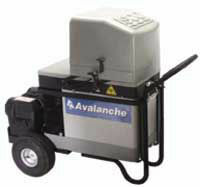 Avalanche™ Transportable Refrigerated Sampler. Isco's Avalanche Sampler is based on the industry-leading 6712 controller. Avalanche provides the advanced control, data logging, and communication features of the 6712, combined with on-the-go cooling from either AC power or a 12-volt deep cycle battery. Delivers 48 hours or more of refrigeration from a 12-volt deep cycle battery. Composite or sequential bottle configurations available. 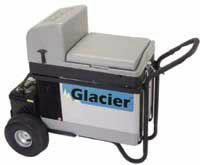 Glacier™ Portable Refrigerated Sampler. Isco's Glacier™ Sampler combines the small size, lightweight, and mobility of a portable with an exclusive new active temperature control system. Its revolutionary design gives you the best of all worlds: easy transport, quick setup, and accurate sample preservation without reliance on ice or utility power! Glacier's new patent-pending temperature control system continuously measures the actual sample temperature, and precisely regulates cooling to ensure accurate sample preservation. ISCO Specialty Products and Accessories. Isco’s offers various specialty products including Class 1, Div 1 Samplers, Pressurized Line Sampling Systems, Rain Gauges and a variety of Communication Options. Isco also offers a wide-range of accessories including Flow and Parameter Plug-in Modules for samplers and multiple Power Products. Please contact us for more information.